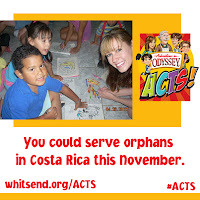 Disclaimer: I received a free Adventures In Odyssey Album in exchange for promoting their Act of Service Challenge & Contest. No other compensation was received and all opinions are my own. Summer is under way and I know some kids get bored with all their extra time. Adventures In ODYSSEY is encouraging everyone to use their imagination to come up with ways to serve in their Acts of Service Challenge. Sometimes kids think that they are to young to serve others, but if they use their talents & their imagination they can come up with ways to serve others in their own neighborhood, church, or community. Mowing the grass for an elderly neighbor, volunteering to help at VBS, or picking up trash at the park are all ways kids can serve. My girls have found a few ways to serve this summer without really thinking about it. Amber is very musical and she volunteered to help with music at our church VBS. It was a great experience for her, she was a big help to the teacher, and she was a wonderful example to the kids who attended. I have decorated cakes for years & my girls like to make cakes when they have a chance. A young man at church turned 13 & they decided to make him a cake. He wanted a 3D basketball cake and I think they did a great job with their first try at a 3D cake. They enjoyed making the cake, and the recipient and his mom were very surprised and pleased. Ask your kids, they may have their own ideas of how they can serve. If you are having trouble coming up with any ideas you might find some in the FREE Summer of Service Kit. 100 Winners will get the new Adventures in Odyssey Album. 2 Grand Prize Winners (one boy & one girl) will travel on an exciting Good-Goers Mission Adventure to Costa Rica this November with a parent. Have your kids read any of the Imagination Station beginner chapter books? My girls love them even though they are below their reading level. They are constantly asking me if there is another one coming out. I have a FREE download for the first book Voyage with the Vikings. I think your kids will be begging for the next one too. I have a great giveaway!! I am giving away the first 3 books in the Imagination Station Series. One of my readers will win the first 3 books in the Imagination Station Series. Just enter the Rafflecopter below. No we haven't, but I'm sure my boys would enjoy them. I have heard about these but haven't read them. My kids would love them! We haven't read any of the books, but I think they look good for my girls. No we haven't read any of the books. I tried to download Voyage with the Vikings, but it never would work for me. We are actually working on one now ;) I am super excited to have this series! Just downloaded the book> Thanks! We have not read any of the books...we have checked out some audio, as well as some video on Jelly Telly. Haven't read this series yet, but we'd love to! I'm off to download the e-book right now! Thanks for sharing this with all of us! I have never downloaded anything before. I haven't read any of these, but we love AIO! I did download VotV and it looks great. I'm looking forward to it as our next read aloud. We love the CD's but I had no idea that there were books! My oldest would love these! STOP! LISTEN! HEAR THAT? THE SOUNDS OF CHRISTIAN AUDIO DRAMA IMPACTING LIVES FOR JESUS! -Christian entertainment & spread Christ’s relentless love for this fallen world! -joining an ever-advancing network of beginners and professionals in an unprecedented opportunity to change our culture for Christ!